March 2011 will not go down in history as my best or most productive month ever. When I’m stressed and encounter long stretches when I have difficulty concentrating, I tend to read role-playing game supplements. RPG adventures and setting books don’t require the sustained attention that a novel does. 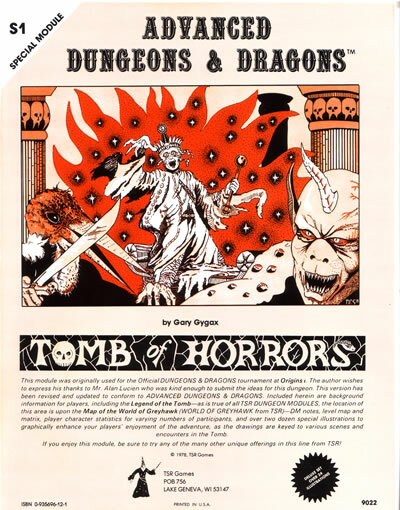 One of the first adventures to be published for Dungeons and Dragons was Gary Gygax’s Tomb of Horrors. Probably more fun to read than to actively participate in, the Tomb of Horrors is a death-trap meat-grinder. Where most adventures are a string of combat encounters strung together by the thinnest semblance of a plot, the infamous Tomb has three combat encounters and dozens of traps designed to kill and maim the greedy, the inattentive, and everyone around them. Unique among adventures up to this point, Tomb of Horrors includes a booklet of pictures so that the players can see what their adventurers see. Which is very important given the technicality and lethality of the traps, but also went a long way towards establishing a ‘feel’ that few other modular adventures have. 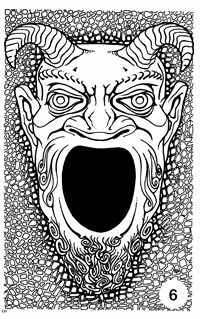 Anyone who has encountered the Tomb of Horrors remembers the Devil’s Head illustration, for example. It has also become a central point for all of the future expansions and revisions. Tomb of Horrors also saw the birth of the riddling undead archvillain trope. Acererak, whose tomb this is, leaves a helpful hint in the form of a poem, in the entrance of his tomb. This was followed by Keraptis in White Plume Mountain, the Dread Crypt of Srihoz, and various other would-be poets that are found in RPGs with some frequency. This trope, for , but seldom appears in other fictions. Partially, this is because of the interactive nature of the game. A riddle handed to a book or television show character doesn’t require the viewer or reader to figure it out. Which is a pity. I love the trope. I think the real key behind the Tomb’s popularity is that is was true to itself. Originally envisioned as the location of an evil undead horror that did not want to be disturbed, the traps were lethal (sometimes exceptionally so), and secret doors and passages placed where they were unlikely to be detected. The players/characters were only encouraged to succeed through the corrective of being killed if they weren’t. Without a lot of luck and foresight, they would not succeed. Most adventures point the characters in the right direction with not-so-subtle clues, or hand over the necessary magic item just before it is required. Not so much with the Tomb of Horrors. Like any good piece of pop art, the Tomb has spawned a number of spin-offs, rip-offs, tributes and homages. D&D has produced a continuation of the Tomb of Horrors at least once per edition, and there have been many imitations, good and bad. For me, they're all wonderful comfort reading. In my head, I can see half a dozen different ways that the characters would react to a trap, and how would they try to avoid it, and what sorts of players' characters are likely to get caught and killed. I find it very relaxing. With My Name on the Cover! I think this is what they mean when they talk about "momentum." 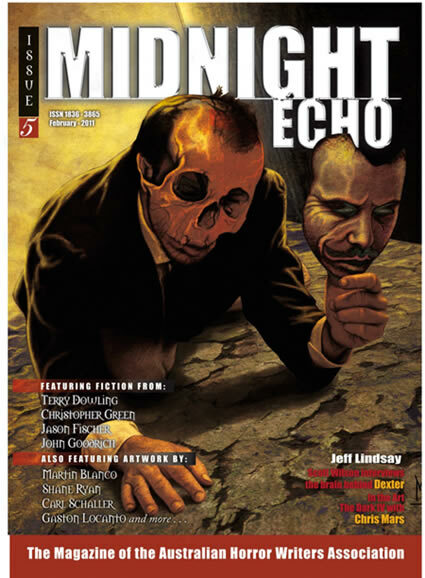 Midnight Echo #5, from the Australian Horror Writers Association, is out, with my story “God of Chickens”. With my name on the cover. You can order it in PDF as well as print from the AHWA website.